My absolute favorite cookies are Oreos. Last Spring I made Oreo Truffles for the first time and fell in love. On a recent trip to the grocery store I saw Mint Oreos and my wheels started turning. 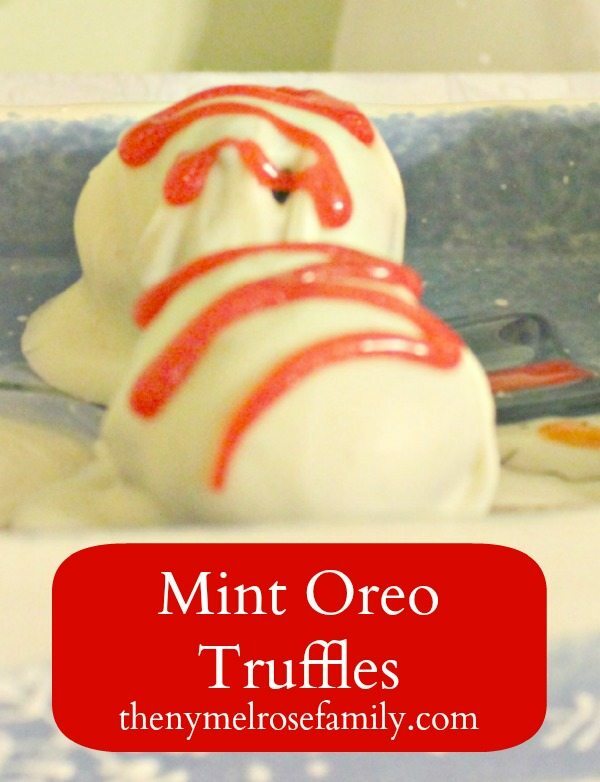 I decided upon delectable Mint Oreo Truffles that only require 3 ingredients! I added a little of Wilton’s Red Sparkle Gel to the top, which would work as a fabulous touch for a Valentine’s Day treat. I can’t even begin to tell you how amazing these truffles are. They remind of the commercials where women are sitting around in slinky dresses nibbling on bon bons. They are just that good. A no bake, delectable dessert perfect for everyday or a special occasion made with only 3 ingredients. In a food processor grind the Oreos into a fine powder. Mix the Oreo crumbs and cream cheese together until it is all one color. Shape into tablespoon size balls and refrigerator for 45 minutes. Melt the white chocolate and cover the balls in it. Place onto parchment paper to dry. Once the chocolate is just about dry use the Sparkle Gel to create a zig zag design. These look & sound amazingly delicious! I love Oreo cookies too, and mixed with cream cheese would be like your own mini cheesecake! I’m pinning to try these…soon I hope! It’s hard to only eat one is the biggest downfall. Happy New Year and enjoy! oh my gosh…. 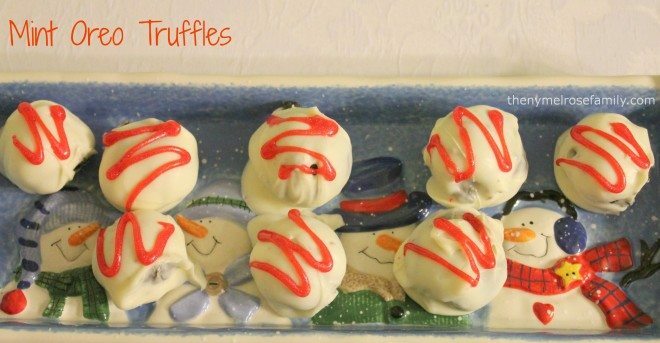 I am making these… look so delicious and so easy! I made a Peanut Butter “truffle” type like this for the first time recently and it was so good and so easy but so impressive. Im going to make these now! These look so cute. my truffles always look like a blobby mess. yummy idea!